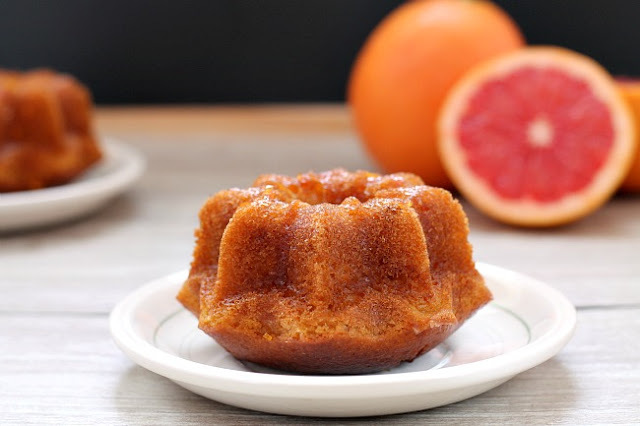 my bare cupboard: Grapefruit-yogurt mini bundt cakes with grapefruit glaze "
I'm fond of citrus cakes and couldn't resist when I saw another one at Joyce's last month . Good thing that the leftover yogurt still tastes well , yogurty ( if there is such word ) , I've checked the expiration date and it was way past it er more than 2 weeks ago ?! Yup , I still used it for this recipe . I'm planning to add ginger because nothing beats the flavor combination of citrus and ginger . The grapefruit glaze is a MUST ! * Preheat oven to 35°F / 180 C . Lightly butter 4 mini bundt pan and one 6 by 2 3/4-inch mini loaf pan . * In a large bowl , combine the eggs , sugar , zest and the oil ; use a whisk and mix until well blended . * In another bowl , combine the flour , baking soda , baking powder and salt , stir to combine . Gradually add the dry ingredients to the egg mixture alternately with the yogurt , in 2 additions ; mix until well combined . Pour batter into the prepared pans . * Bake for 35 minutes or until cake is golden brown and tester inserted in the middle comes out clean . Let cake cool in the pan on a wire rack for 10 minutes before unmoulding . They look beautiful and nicely baked. Can I have a piece of your cute bundt ones? as usual, they look pretty! bake it into little bundt, handy and cute! Anne, like you,I also enjoy cakes with citrus peels...Definitely a refreshing sweet treat in a very cute bundt moulding!! Yummy! They are perfectly made. The grapefruits flavor must been a lovely explosion for the added taste. They look so beautiful! And yes, grapefruit glaze is definitely a must! Wow, your version with the grapefruit sounds delish! Too bad you have forgotten to add in the ginger, it would be a wonderful addition too! Your cake texture looks perfect! I hate slicing the zest by hand, used to do that before I had the zester years ago, not the microplane one, mind you, that is darn expensive! I'm eyeing that one too! I'm glad that you have tried out this cake! Grapefruit! You are good! You are funny Anne! If the yogurt is not moldy or does not smell bad it is safe to eat after the expiration date. You did it right by using in a cake. Looks beautiful and I will be looking forward for another cake with ginger in it. I love your mini Bundts....so darn cute! 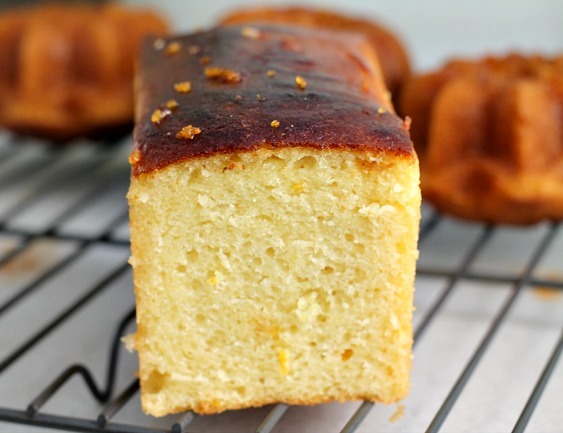 I need to try a grapefruit cake...a citrus I haven't baked with before...and I love them! I love your mini versions of desserts and cakes, very adorable. 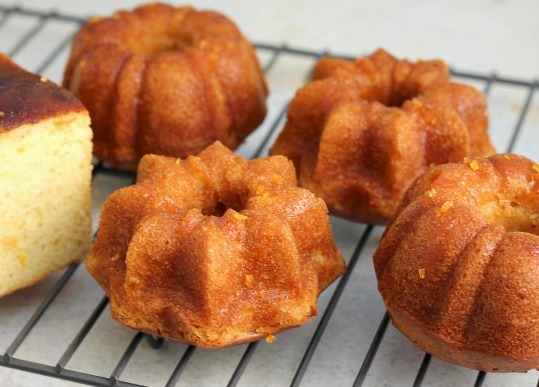 These mini bundt cakes look so cute, can just pop one into my mouth. Definitely the grapefreuit glaze will enhance the look as well as the taste.